U.S. 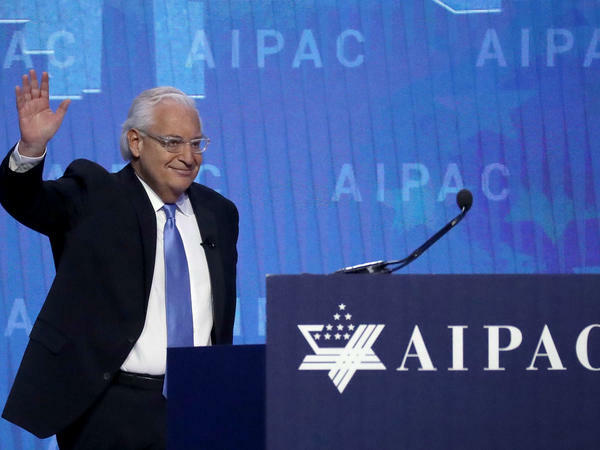 Ambassador to Israel David Friedman addresses the American Israel Public Affairs Committee on March 6. Friedman, an outspoken supporter of Jewish settlement in the Israeli-occupied West Bank who has previously questioned the need for a Palestinian state, tells NPR that "President Trump's made clear that if the Israelis and the Palestinians agree to a two-state solution, he would support it. And that's our policy. It's not something that the United States is prepared to impose on either side." I think the move is going to permit the parties to focus on issues that are, first of all, important. And second of all, solvable. What the president did when he made this decision was to remove from the Palestinians the right to veto the recognition by the United States and other countries of Jerusalem as the capital of Israel. And it really was, and I think in the president's view, my view as well, it was an inappropriate card to play. ... It's preventing an illegitimate point that could be asserted by the Palestinians. ... Palestinians have legitimate issues. ... The argument that Jerusalem is not the capital of Israel — it's just not, it's not a fair point for them to make. That's a good question. We're still working on it. ... Timing is everything in life. I think we're waiting for the right time. President Trump's made clear that if the Israelis and the Palestinians agree to a two-state solution, he would support it. And that's our policy. It's not something that the United States is prepared to impose on either side. But if they agree to it, that's certainly something the United States would support. ... This is a decision that Israel has to make for itself and in conjunction with its negotiations with the Palestinians. Now look, a two-state solution would be a wonderful thing if it could be negotiated, agreed to and accomplished in a manner that doesn't threaten Israel, threaten the nascent state of Palestine and threaten Jordan, Egypt [and] Gaza; and one of the things that I think the Palestinians need to be able to demonstrate is that a Palestinian state on the West Bank will be different than the Palestinian state that exists in Gaza. Well, first of all, I would take issue with beginning the history lesson in 1947. Go back another 3,500 years, go back to the Bible. I'll tell you an interesting story. One of the great commentators on the Bible, his name was Rashi, and he said the reason that the Bible begins with the creation of the world is to create the chain of title from God directly to the Jewish people for the land of Israel, so that if the nations of the world say the Jewish people don't own the land of Israel, they would point to the fact that God created the world and gave it to them. I don't know what he was talking about, so I just would be speculating if I told you what he meant. Look, we don't we don't look at things in terms of price ... it's the wrong way of looking at it. There's either a better opportunity for Israel and a better opportunity for the Palestinians, such that they both look at it and say we're better off with something new than the status quo or it doesn't work. And when he talked about it in terms of prices, compensation, it sounds like a punishment, and then why would anybody do that?